The pool looked nice. Not as described. Rather run down - see comments next oaragraph. Building is nice, room is fairly large and with a table to eat. The pool was lovely. the breakfast was good. Room was spacious. Unique location with a marina and was near much wildlife and fishing possibilities. Our favorite part was that we got two boat tours--a kayak tour and a boat tour in the 10,000 islands--from the marina at the resort. It was also very convenient to drive to Marco Island, Everglades City, nearby state parks/preserves, and Shark Valley. 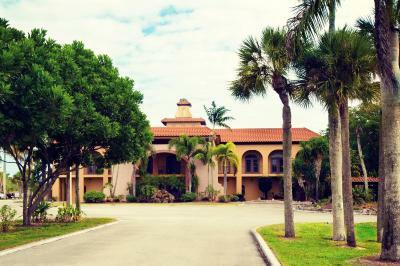 It's a wonderful resort in the Everglades, beautiful and quiet with a big swimmingpool to relax. We were 3 times there and had 2 times a very nice room in Building F and in the main house. The location is on a canal and has also a marina and a little shop. Our room had a kitchenette, bed, couch, table and chairs, which was a lot to pack into the size of the room, but it worked ok. Small screened porch on the front of each room is also a great option for sitting outside. Pool area was very nice. Decent breakfast. Location was great for visiting the everglades. Equal distance between Marco Island and Everglades City. Great having a restaurant onsite since there are no other restaurants close by. Also really nice to have live music both nights we were there! 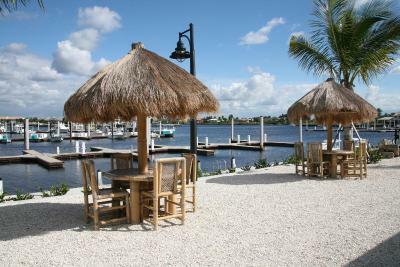 Port of the Islands Everglades Adventure Resort This rating is a reflection of how the property compares to the industry standard when it comes to price, facilities and services available. It's based on a self-evaluation by the property. Use this rating to help choose your stay! 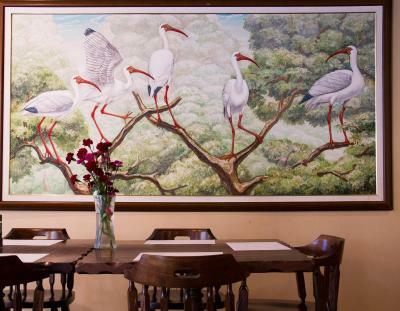 This Naples hotel features direct access to the Florida Everglades. A continental breakfast is served every morning. Marco Beach is 18 mi from the property. Each studio at Port of the Islands Everglades Adventure Resort offers a shared balcony overlooking the resort and cable TV. The studio includes a microwave, small refrigerator, and a coffee maker. The property features an outdoor pool for guests to enjoy. BBQ facilities and a game room are also offered. 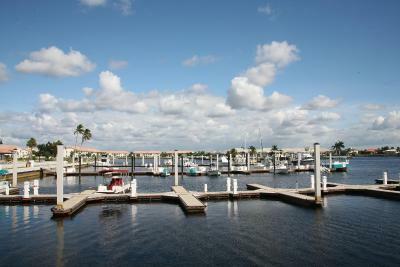 A full service marina with boat slips is available onsite. Angler's Cove Restaurant & Bar serves lunch, dinner and cocktails in a nautical setting. Marco Island is a 22 minutes' drive from the property. Downtown Naples is 34 minutes' away. 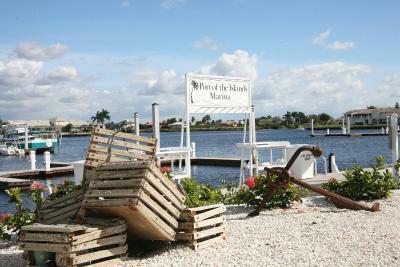 This property is also rated for the best value in Everglades City! Guests are getting more for their money when compared to other properties in this city. 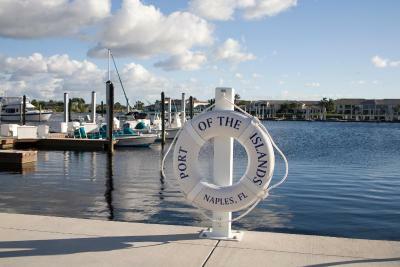 When would you like to stay at Port of the Islands Everglades Adventure Resort? This studio features a balcony, microwave, and small refrigerator. House Rules Port of the Islands Everglades Adventure Resort takes special requests – add in the next step! Port of the Islands Everglades Adventure Resort accepts these cards and reserves the right to temporarily hold an amount prior to arrival. Please note full daily cleaning services are only provided for stays over 5 days. Room a bit aged - but clean. Restaurant is the only option in quite a distance and they seem to know that price wise- quality and taste was quite good though.Automatic 20% tip charge - why not leave it to customer to decide on tip level? Pool area clean and spacious. Nice lobby and restaurant. Free Breakfast. Room was clean. The website makes you think you are in a hotel, but you are outside in some worn building. Blinds didnt cover window on door so you could see right in/out to the people walking past. Internet didnt work, which was needed for a work meeting. Left after 1 night. Clean, quiet and friendly people. Air conditioner was noizy, that woke me up 4:30 in the morning, unfortunately. Just for spending the night after the long flight and possibility to have a breakfast in the morning were our expectations. It was closiest place after Miami to stay for a night and not very expensive for us. We leaved after the breakfast to Naples. Very beautiful surrounding! 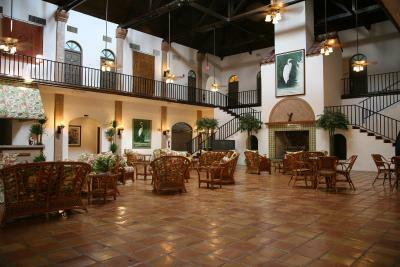 The resort was dated and the rooms were oddly set-up. Only two pillows on the bed and no dresser. The wifi was very spotty and did not work in my room. In desperate need of modernisation and a good clean. The breakfast was very basic. The location was perfect. The bed itself was clean and comfortable. We also loved the fact that it had a large pool and a games room. The entrance to the hotel is beautiful. The room did not match. It was dated. The bed was very uncomfortable and the box springs were noisy. The air unit was incredibly loud and only worked at random. But as much as we appreciated the room, there was no WIFI, which is not what had been advertised. The room was clean, very spacious, bright, and comfortable, in sum, very good. Most rooms have views on the road/parking and the balcony is not private. Pool closes early but this is more a note than a complaint since it is by law and lighting at night would be a problem with mosquitoes. restaurant, bar, the caged rooms in the out buildings , the rooms have seen better days as have the bathrooms, restaurant was over priced, and was trying to be something it clearly wasn't , should stick to all american food . should not tag on an automatic 20% to everything from the bar .